from the Audio Publishers Association, in the Original Works Category. Well, it certainly fits in that slot: It’s about as original as they come. Written for audio from the beginning, and the performance by David Ossman was the World Premier of the piece. 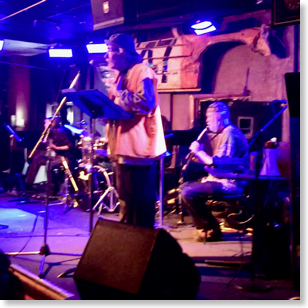 Great Northern Audio and Otherworld Media were pleased to present it back in June at The Brick, in Kansas City, MO, with eclectic jazz behind the Old Cart Wrangler himself. You know that guy. He’s the one who’s always out there chasing down the stray carts, the ones that are out on the edge of the parking lot looking longingly at the bigger world beyond. Takes a lot to impress me, but you did it. I can’t think of anyone better than David Ossman to perform this piece. … It is really really good. Like perfect. And in front of a live audience. Oh yeah, and Dwight’s backing was so nice to hear, very fine indeed. … I have to admit, it’s rare I listen to a piece all the way to the end, but you nailed me in the first minute … maybe seconds. The sublime jazz backing band was Rev. Dwight Frizzell on woodwinds, Julia Thro on guitar, and Patrick Conway on percussion. Subtle sound effects were from Tony Brewer. This photo of the performance was taken by Phil Proctor, also of the Firesign Theatre. The disc or download is available from Blackstone Audio’s Downpour site. 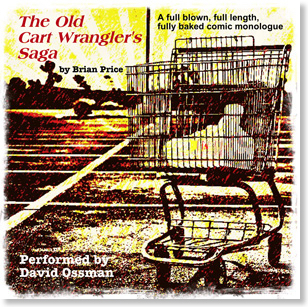 It includes a half-hour conversation between author Brian Price and David Ossman, talking about the work, the performance, and the Cart Wrangler character. I mean, besides going to The Brick while in Kansas City, we attended the HEAR Now Festival of Audio Fiction. There we had the delight to present the annual Mark Time Awards, and as the opening to that we staged one of our own audio plays, Dialogue With Martian Trombone. The all-star cast included David Ossman, Phil Proctor, Melinda Peterson, Orson Ossman, Richard Fish, and Donna Postel. You can hear that here. In July I went to the 20th Anniversary Convergence science fiction convention in Minneapolis. There I was able to help out with the Big Fun Radio Funtime performance by Fearless Comedy Productions. They were kind enough to invite me to do sound effects for the show, which I was happy to do. They also let us write a sketch for them, so we offered up The Awk Awk Incident, about the dangers of telling the Bird Watchers you’ve seen something rare around your own place. Our thanks to Tim Wick, artistic director at Fearless Comedy, for the opportunity. June 7th, in Kansas City, MO, the HEAR Now Festival will host the presentation of the Mark Time Awards for 2018. 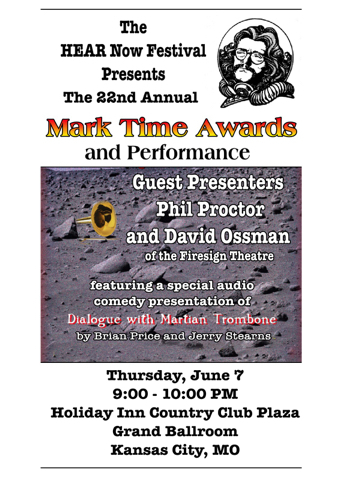 The ceremony will include a performance of Great Northern Audio Theatre’s Dialogue with Martian Trombone, starring David Ossman and Philip Proctor, of the famed Firesign Theatre. All this will take place at 9:00 PM in the Grand Ballroom of the Holiday Inn Country Club Plaza Hotel. The Mark Time Awards are well known in the field of contemporary Audio Theater for their recognition of the science fiction, fantasy and horror genres. 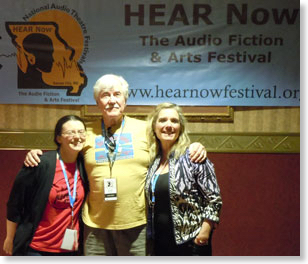 In cooperation with the HEAR Now Festival of Audio Fiction they have expanded to include detective stories, and this year added a comedy category. 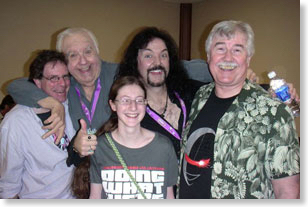 They are named after the Mark Time character created by the American comedy troupe, the Firesign Theatre, and have been actively supporting audio drama since 1997. Mark Time Awards are given internationally, and have been won by producers from Ireland, Canada, South Africa, New Zealand, Belgium and all across the United States. The presentation and performance includes a radio play that answers the question of what became of the Ramon Raquello Orchestra, the ones that played at the Meridian Room on Orson Welles’ infamous War of the Worlds broadcast back in 1938. We’ve all wondered about that, and now the whole story can be told. The play was written by Brian Price and Jerry Stearns of the Great Northern Audio Theatre, both Mark Time Grand Master Award winners themselves, and besides Ossman and Proctor features an all-star cast of Melinda Peterson, Richard Fish, Donna Postel and Orson Ossman. It was first performed back in 2004. This production is in conjunction with OtherWorld Media and HEAR Now. The HEAR Now Festival will run June 7-10, 2018 in Kansas City, and includes many other performances and workshops in the fields of audio storytelling, audiobooks, podcasting, childrens literature, and a celebration of Mark Twain. You can hear more from the Firesign Theatre, too. Dec/27/17 15:29 Filed in: Great Northern productions | Audio production. Over the years while writing, directing, and acting at radio theater workshops and in the Mark Time Radio show performances at Minneapolis' CONvergence science fiction conventions, Brian Price and David Ossman found that they shared a love for classic Beat poetry, Lord Buckley, and prose poems, so they started doing some of their own. This is a collection of their unique hybrid of humor, music, character, and performance. “Great short stories by one of my favorite writers!” – David Ossman. Written by Brian Price, except for the one that was written by Brian Price and Jerry Stearns. 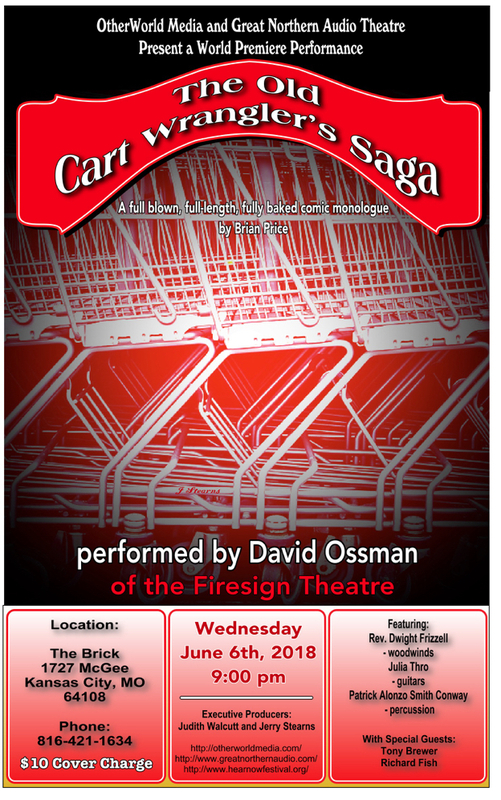 Performed by David Ossman, except for the one performed by Richard Fish and the one performed by Eleanor Price, and the ones performed by the whole cast. Available at the Blackstone Audio Downpour website. Some are posted here on our Mark Time Radio History page. And since you’ve read this far, it turns out there IS a conclusion to the Cart 437 Trilogy. Coming soon to a website near you. Brian Price and Jerry Stearns had a good time at the 2017 HEARNow Festival of Audio Fiction in Kansas City, MO. I thought I’d tell you a bit about what we did, and hope it inspires you to attend sometime. Remember, this is only some of the events that we were connected with; there was a LOT more going on than this. You can check their online schedule to see more. First of all, this was my first chance to actually see the Audie Award we won for Best Audio Drama from the Audio Publishers’ Association, for In The Embers. Brian says the New York TSA took him out of line at the airport because of this oddly shaped and unscanable item in his pack. They opened it up, said “Congratulations”, and sent him on his way. In the evening we did a Best of Audio Fiction presentation, joined by Robin Miles, about our award-winning piece, In The Embers. We got to talk about how it came to be, and about some of the technology that enabled us to put it all together even though few of us live in the same section of the country. We shared the hour with Russell McGee, who is a sound designer for Big Finish’s Dr. Who audio series. He came with a computer presentation, way better prepared than we were. We were able to spend some time with Russell and his wife during the Festival, too. Brian went to help out with the Workshop 101 team, teaching about the writing and production of audio theater. Follow the link to hear some of the short works that they completed during the Festival. Jerry attended a playback session at a local theater - where it is great to be able to hear productions on a BIG excellent sound system and in a room designed for listening. I chose to attend a session presented by two other people who put audio theater actually on the radio. Hosting were Catherine Rinella of Midnight Audio Theater at WCBE in Columbus, Ohio, and Christy Duntan of KZMU community radio in Moab, Utah, who brought us Downtown Abbey. Both shows really fun to hear. Next Brian and I both hosted a session in the theater called Simon Jones, A Retrospective. He is the original and genuine Arthur Dent of the Hitchhiker’s Guide to the Galaxy, accept no substitutes. Technical difficulties threatened to make it a difficult session, but Simon’s good humor made it into a hilarious hour of stories from his illustrious career on stage and in radio, TV, films, and audiobooks. Friday evening we were able to slip away for dinner at Arthur Bryant’s barbecue restaurant with Simon Jones and his wife, Nancy, Russell McGee and his wife, Elizabeth, and Rich Fish, Tony Brewer and Butch D’Ambrosio. In the afternoon Brian and I were pleased to moderate a session for the Podcast Palooza presenters attending the Festival. This has been an important event for us because it gets all these producers from around the country in the same place to talk and listen to each other about what they are doing, and ways they might be able to do it better. It was well attended, and everybody had something to say, and an attentive audience. This morning is the closing brunch and awards event for the Festival. One of the things that happened here was the presentation of the annual Mark Time Awards. Organizers David Ossman and Judith Walcutt called in via Skype to announce the winners, who were chosen this year from Firesign Theatre’s biggest supporters over the years. Brian and I were asked to read the acceptance speeches from the winners, but Brian had a better idea, and we were able to get Simon Jones to read them – which was WAY better than having us do it. David commented that he’d like Simon to read all their credits in the future. And the final Big Deal at this ceremony was the presentation of the Norman Corwin Award. 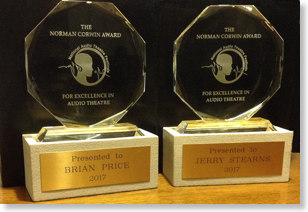 Brian and I are greatly honored to have received this award, and especially in conjunction with the Corwin Legacy Award given to Stan Freberg, one of our heroes of audio comedy. We’d like to thank Sue Zizza for being a gracious host to the Festival and to us. Thanks also to David Shinn for technical wizardry at a variety of incompatible venues. And to the NATF committee who somehow thought we were deserving of an award for sticking with something we loved for many years, and having opinions about it. In The Embers wins Audie! June !st the Audio Publishers Association announced the winners in their annual Audie Awards in New York City. We are pleased to say that In The Embers took the prize in the Audio Drama category. We’d like to thank the Academy, the Foreign Press Association, our long-suffering families, Tom Lopez, the excellent cast, CONVergence, and librarians all across the country for this great honor. We are pleased to be recognized for something that we loved doing. “Ours is not to create the machines of the future. They have also created many excellent studio productions, and their work is not always comic. It can be pointed, ingenious, and dramatic, crossing genres and offering new viewpoints on modern life. To give just a few examples, Tumbleweed Roundup turned a Western story on its head with a wild cowboys-and-aliens encounter; Drummer's Dome explored generational realities and perceptions; Solid State University took a look at education as it was, is, and might become (winning the Golden Reel Award from the National Federation of Community Broadcasters); Dialog With Martian Trombone ingeniously revealed the real extra-terrestrial invasion that was covered up by Orson Welles' famous broadcast; and In The Embers – a truly classic original story of music, memory, and time and was mastered at the legendary ZBS studios – has won an Audie Award for Best Audio Drama. . 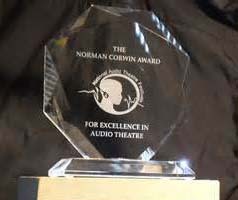 The Norman Corwin Award for Excellence in Audio Theatre, given annually by The National Audio Theatre Festivals (NATF), is the premier American recognition of lifetime achievement, regardless of media, in the field of audio theatre. It was instituted May 3, 2010, on Norman Corwin's 100th birthday. The first Award was given to Mr. Corwin himself, who is considered the Grand Master of American radio theatre. 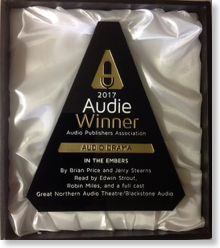 The Audio Publishers Association announced the finalists for the 2017 Audie Awards on February 8th, and Great Northern’s In The Embers is included as a finalist in the Audio Drama category, and in the Original Work category. We’re very pleased by this event. 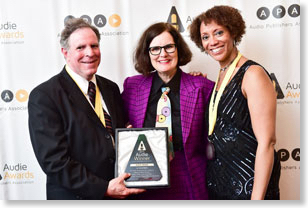 The Audies are given each year for the best in audiobooks, and for the narrators who perform them. A review in AudioFile Magazine announced when In The Embers was released by Blackstone Audio on their Downpour website. We are very pleased to be published by Blackstone, one of the leading audio publishers with an ear for audio theater. You can also find In The Embers as a download in the ZBS online catalog. The Blackstone release includes three original songs integral to the story and a 70-minute In The Embers - The Making Of documentary created especially for Blackstone. 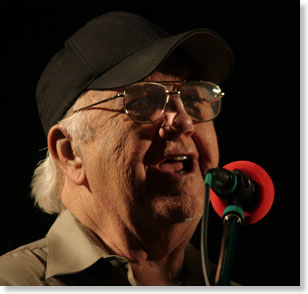 The song lyrics were written by Brian Price and sung by Robin Miles, with music performed by Mike Wheaton. (In The Embers, My Columbine, and My Gorgeous Boy.) The documentary consists of commentary from the writers and producers, and interviews with the actors, musical composer, and producer Tom Lopez of ZBS. We also introduced the two actresses who played the grownup versions of the two sisters at the center of this story, Robin Miles and Jacquie Maddix, on KFAI radio recently. The two had not met until we brought them together on Sound Affects to talk about their roles. This is the final chapter. Turner tells about what he knows of the end of an era. And then maybe he shuffles off. See all the Turner Ashbey Chapters here. Turner and Laze Fitzgerald participate in a happy ending or do they? 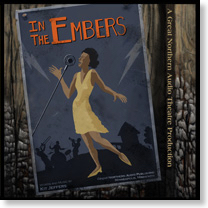 Great Northern’s newest feature-length audio production, In The Embers, is available now from the ZBS Catalog. Downloads include the 80-minute production in 320 kbps resolution, and a PDF CD cover image suitable for printing. A new review in AudioFile Magazine announces that In The Embers will be released by Blackstone Audio on their Downpour website on December 8th. We are very pleased to be published by Blackstone, one of the leading audio publishers with an ear for audio theater. This new release includes three original songs integral to the story and a 70-minute In The Embers - The Making Of documentary created especially for Blackstone in cooperation with Waterlogg Productions. The documentary consists of commentary from the writers and producers, and interviews with the actors, musical composer, and producer Tom Lopez of ZBS. 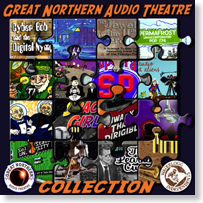 Blackstone also carries the entire Great Northern Audio Collection in a Boxed Set of 18 stories, including many from the celebrated Mark Time Radio Shows. You can get them individually or all together as downloads or on CD or MP3 CD. You can even rent them if you just want to see what this silliness is all about. 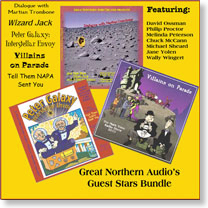 These are whimsical and original tales of science fiction and fantasy, featuring the voices of Firesign Theatre members David Ossman and Phil Proctor, and well known Hollywood actors Chuck McCann and Wally Wingert along with the superbly comic regular cast. The tales include Tell Them NAPA Sent You, about wizards, dwarfs and auto parts; Dialogue With Martian Trombone, the real story behind the Ramone Raquello Orchestra featured on Orson Welles’ War of the Worlds broadcast; The Jewels of the 11th Generation, a tale of a 300-year-old starship, kids, space pirates, and squeaky toys; and much more audio fun. The world is changing. The Age of Indenture is collapsing. And Turner and Laze Fitzgerald are trapped in the crossroads town of Trinidad, Colorado. Turner and Laze have returned from Cyberspace. Unfortunately, one of them didn't quite end up where they should have been. Turner and Laze find out that cyberspace is like real life, except it's a longer way down. 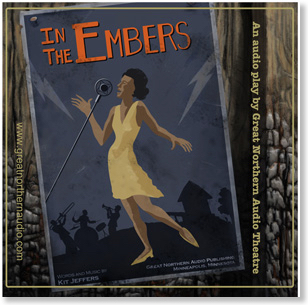 Great Northern Audio is pleased to announce In The Embers, our new feature-length audio play which premiered at the HEAR Now Audio Fiction Festival in Kansas City last week. Stay tuned as we prepare several avenues for distribution of this exciting audio experience. Urban archaeologist Digger Morgan has this new technique using a laser to read what’s embedded in the charcoal of a burned wooden post. He doesn’t expect to find voices. It’s two girls who were in the barn when the post was burned, and now he wants to know who they are. He also doesn’t expect it when one of those voices starts talking to him from his computer. Kit Jeffers was an up-and-coming jazz singer in the 1920s, and now she’s asking him just as many questions as he’s asking her. She’s smart, she’s sassy and saavy, and she wants to go home. Good science fiction, engaging characters, original music and terrific sound design make this well worth listening to. A brand new audio play from Great Northern Audio, starring Robin Miles as Kit Jeffers, and Edwin Strout as Digger. With original songs by Brian Price and Mike Wheaton. Mixed at the ZBS studios in upstate New York, with Tom Lopez. CDs are available online currently through Uncle Hugo’s SF Bookstore and Dreamhaven Books. “The story is excellent, the music is excellent, the audio quality is excellent, and so are the actors. This is a drama that goes in the permanent collection.” See this recent review of In The Embers by Scott Danielson of SFFaudio.com. 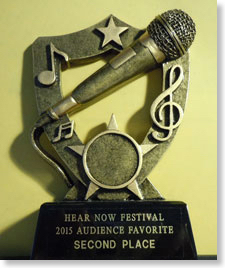 And while we were there at the HEAR Now Festival, we shared a Second Place Audience Favorite Award for the presentation of the new Mark Time Awards. Brian Price and Jerry Stearns played excerpts of this year’s winners in the mornng, and Judith Walcutt produced the Mark Time Awards presentation ceremony on Friday evening, with David Ossman doing the honors. See the Mark Time Awards website for a complete list. It was probably the kids from the Paseo Academy of Fine and Performing Arts, who wrote and performed their own work that won the audience over, though. So they really should have this award. It was the first year for the new Nick Danger Prize for best detective/suspense audio theater, and we are sad to pass on that the real Nick Danger, Phil Austin of the Firesign Theatre, passed away on Thursday, June 18, just the day before the prize with his likeness on it was given out. Here’s the LA Times obituary. Turner describes the cliffs and dunes of Cyberspace and what it is like to be stuck in the mind of the one you love. Those old personal tracking memory chips were nothing but a pain in the rear. Turner and Laze's chips have flipped and now they are in each other's heads. How muc4 room is in there? Great Northern is On the Air! Mar/27/15 21:00 Filed in: Great Northern productions | Mark Time Radio Show | Audio production. Starting Friday, March 27, four Mark Time Radio Shows will be broadcast on the Midnight Audio Theatre, which comes out of WCBE in Columbus, OH. The show is on at Midnight, so it’s actually Saturday mornings, but there we are. They will be playing four of our works over the next four weeks. You can go to the source and listen to the stream at http://wcbe.org/, or you can pick it up on their podcast anytime at http://midnightaudiotheatre.com. We thank them for supporting the audio medium, and for playing our stuff for you. 04/17 - Space Girl, featuring David Ossman, Phil Proctor, and Melinda Peterson as SpaceGirl. 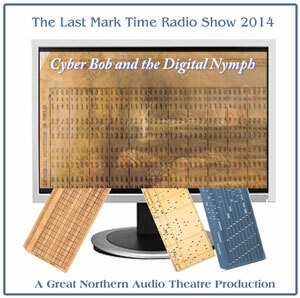 AND our recent production, Cyber Bob and the Digital Nymph, is the current offering on the great Radio Drama Revival podcast, Episode 408. This is the Last Mark Time Radio Show, with David Ossman returning to the raucous stage for the farewell performance of this long-running series. (See the history of the series.) Thanks to Fred Greenhalgh for throwing one of ours up against the wall of sound. And thanks for David Farquhar for making several more of our works available for listening at the Moonlight Audio Theatre podcast as well. Some of them are free to hear, and some others are in their Premium Episodes list. Either way it’s another way to listen to the Great Northern Audio Theatre brand of new and different audio. Our Three Wizard Tales collection is one of their Top 25 Free Shows. So, have at it. Jerry was interviewed recently by Stuart Flynn for his science fiction blog: SCY-FY: THE BLOG OF S. C. FLYNN. Take a look at http://wp.me/p4T72p-fc. See what he has to say about podcasting and his radio show, Sound Affects, and about the work that Great Northern Audio has been doing for 20 years. We at Great Northern Audio are planning to be at the National Audio Theatre Festivals HEAR Now Festival the weekend of June 11-14. If you’re interested in audio theater, audiobooks or other kinds of audio storytelling, this is the place to come. There will be lots to listen to, lots of interesting people to talk with about audio fiction, and presentation of the new Mark Time Awards for audio drama. Find out more at http://www.hearnowfestival.org. Turner finds himself drowning in the sands of West Texas and he has stumbled upon the Fair Liza Fair, but is the Fair Liza Fest just a simple Fertility Rite or something more? Mar/12/15 14:35 Filed in: Great Northern productions | Audio production. Yes, we’re working on a new piece called In the Embers. It concerns audio archaeology, a 1920s jazz singer, and quantum tunneling. I know, that’s a bit obscure, but we don’t want to give it all away. Let’s say it has some terrific characters, some very interesting science fiction ideas, and lots of great sound. We’ve been working on it for a year and a half, and now we are assembling the voices and sound effects, and some original music. We’ll be turning to the top-of-the-field engineers at ZBS for the final mix next month. We expect a release date in June. We are working very hard not to sound like what you have heard before. It’s not old time radio. It’s not the latest comic book loud-in-your-face style soundscape. It’s more an Independent Film style, with good acting, real music, and thoughtful sound design to bring the story to your ears. There's smoke in the air and it turns out Texas is on fire. So, Turner and the Magic East Tennessee Travelers head for the hills in search of clear skies. Turner and a perfect specimen of a human being are about to leave Texas when they witness a very special magic show and are compelled to stay. Also on the playlist is A DAY AT THE LIBRARY where they answer that electric question, "What would be the first thing you'd make with a 3D printer?" A 1958 Ford Edsel, of course. We also find there are other things we can make to enhance our 3D lives. Both pieces recorded live before a very appreciative geeky audience at Convergence 2014, Bloomington, MN. We give heartfelt thanks to the convention for their support all these years. Especially we thank the Main Stage crew and the ASL interpreters for helping to make the shows possible. We’ve had a terrific ensemble cast, and some great guest stars over the years. We hope you’ve had as much fun listening to them. Available for download at ZBS. To be broadcast on Sound Affects on December 7, 2014. Turner makes it back to Richmond and then ends up Texas. But it's not because of the chip in his head. It's because of the chip in Laze Fitzgerald's head. Is Laze Fitzgerald really the legendary Fair Liza, the Angel of the Unity Movement? Turner is trapped in a cave with the evidence. The Somerset, Kentucky Irregulars (and we're talking irregular) believe that they have cornered Fair Liza in a cave in the hills. Turner is hoping to get there first. Mar/13/14 14:19 Filed in: Audio novel | Turner Ashbey | Great Northern productions | Audio production. A song about Fair Liza, The Saint of Reunification. Liza waited quietly by the side of the road and would not let them take that orphan boy. “Fair Liza lay in wait and she smote them.” But what does that mean? Fair Liza and the song seem to have a basis in the recent history of the Sundered States. Great Northern on Facebook & Twitter! The Great Northern Audio Theatre is finally on Facebook and Twitter. We had to bring on Kris Markman, our new Director of Communications and Media, to do it since none of the rest of us even thought to look. We’ll be posting about Great Northern activities, the annual Mark Time Awards, and other stuff from the Audio Theater community. So get over there and Face us, or whatever it is you do. Speaking of community: Feeling a little under the weather? We recommend just a single bottle of Rosenblat's Native Restive Oil and Elixir. Listen to a brand new piece called, Common Side Effects, starring Barbara Rosenblat and Sande Sherr, written by Barbara R. and Brian Price for VoiceScapes Audio Theater. 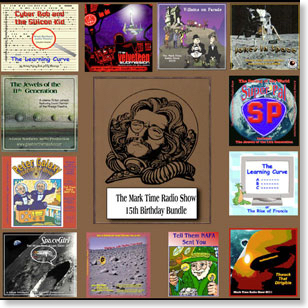 Yes, the Mark Time Radio Shows are all ON SALE at ZBS. So if you didn’t get them before, NOW is your chance! Highest quality audio download available anywhere - all at 320 kbps. Did we say? 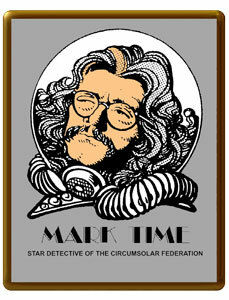 MARK TIME FIRESIGN THEATRE GUEST BUNDLE - was $39.42, that´s crazy, now $34.95. The MARK TIME GUEST STAR BUNDLE - was $19.42 now a ridiculously low $14.95. and The COMPLETE MARK TIME RADIO SHOW COMPLETE BUNDLE - (was $59.42) -- 15 years of science fiction satire and lunacy performed on a live stage in front of a live audience for just $52.95. That includes 14 shows plus a number of audio shorts. "The collection of CDs you guys have done over the years at the Con embody some of my favorite live performances (and the few opportunities to play in other writers´ work!)" "The most fun I´ve had in 20 years." "I´m not putting that bucket on my head." "That´s it. I don´t want to play the dwarf anymore." "You can´t have two Scotsmen in the same play. It´s just not done." "It´s ok, Philip. I´m sure they´ll do better the next time." "Look, really, the dinosaurs aren´t mine." Yeah, we do make them available for sale, but all of these have been on many peoples’ podcasts for years, so it’s not like they aren’t out there to find. This is just the high-quality audio files with a CD cover PDF file included. While we’re on the subject of ZBS, we’re broadcasting their latest Jack Flanders story, Dreams of Tiffany Blue, on Sound Affects: A Radio Playground on KFAI community radio. It’s January 5 and 12, 2014. If you missed one, they’re kept in the archive on the KFAI website for two weeks. AND, a wonderful ZBS series called Saratoga Springs is being made available for listening by the online news-site, Saratoga Wire, along with a nice writeup about Tom Lopez, the talent behind everything ZBS. 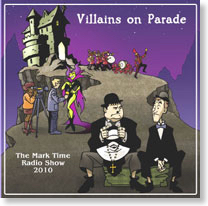 And finally, all the Mark Time Radio Show CDs are available at Uncle Hugo’s Science Fiction Bookstore, in Minneapolis, including the latest ones - Jokes in Space with VIllains on Parade, and Thwack That Dirigible with SpaceGirl, which aren’t available on CD anywhere else. CDs specially made for Uncle’s. Turner enters the Realm of Kentucky and joins a band of entrepreneurs selling citizenship and peerage transfer papers to honorable customers. The great Get Gone is in progress and Turner and his new friends, Ed and Claire, are headed to Colorado, but it looks like Kentucky might be in the way. The venerable historian, Turner Ashbey, never did like the number thirteen. Here's what he did about it. Turner and Laze Fitzgerald are saved from a drone attack when all the drones mysteriously drop out of the sky. Laze says they all need to leave their safe haven at the underground Library, and Turner escapes from further attacks, but hates to leave Laze behind. The estimable Joe Bevilacqua will be broadcasting several works of the Great Northern Audio Theatre on his online radio show at Cult Radio A-Go-Go. These will be about once a month on Saturdays, beginning this Saturday, April 20th. What if a citadel of higher education was completely automated? 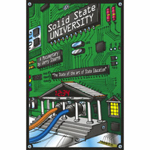 Great Northern's Solid State University will be featured this Saturday, April 20, 2013 on The Joe Bev Experience. (http://www.joebev.com/) That’s at 3 PM EDT and 12 Noon PDT. Written and produced long before computers started showing up in classrooms, just about everything in this academic send-up ended up coming true. 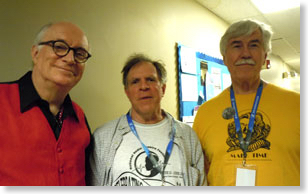 Featuring Dan Coffey (Dr. Science himself), Dave Moore and Jerry Stearns. Winner of the Golden Reel Award for Best Radio Drama for 1993 from the National Federation of Community Broadcasters. Joseph Bevilacqua's website is entertaining, informative and goofy–a wonderful mix and just the kind of place to hear SOLID STATE UNIVERSITY – hope you have time to visit. 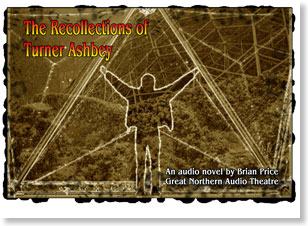 And listen in for other Great Northern Audio works in the coming months. The Spontoon Islands are in a cartoon world between 1920-40, inhabited by furry animal cartoons and seaplanes. Artists from all over the world contribute art, strips and stories to the shared universe. 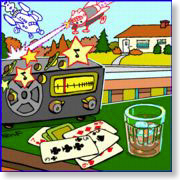 E. O. Costello contributes radio scripts evocative of the time and place, filled with original characters and sounding like a cross between Old Time Radio and the Sunday Comics. 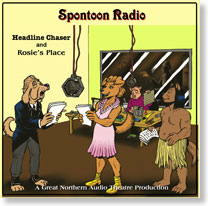 The Great Northern Audio Theatre is proud to present two of the many scripts available at: http://spontoon.rootoon.com/SPwRdoCn.html. Rosie’s Place is LuChow’s, the spot where every fur goes for lunch on Meeting Island. “It’s Shot From Guns” is about Rosie, when she hires dimbulb brothers B’onss and K’nutt to do laundry for the restaurant. B’onss powers the washer with an airplane engine, showing the consequences of stupidity as a way of life. The usual characters show up at Rosie’s lunch counter, too. The Headline Chaser is Michael Mooney, a new reporter for the Spontoon Mirror. In “If You Can’t Stand the Heat”, when his minkess friend tells him about local restaurants losing food right off the loading docks, he knows there’s a story there. He’s a reporter, he can’t help himself. He has to investigate. Featuring Simon Jones (Hitchhiker’s Guide to the Galaxy) as publisher Charles Foster Crane. Turner and Laze Fitzgerald talk about the recent history of the Republic of Texas and how everyone was afraid of what it meant. They have an afternoon of feeling relaxed and free, and suddenly discover that they aren’t as alone up there on the mountain as they had thought they were. Turner finds Laze Fitzgerald, talks about a billionaire who bought a state government, and the beginning of the dissolution of the former United States. This year marks the 15th anniversary of the coveted Mark Time Awards—the only awards given annually to honor the best in science fiction and fantasy audio theater. (Meatball Fulton has a lifetime achievement award from Mark). Each year Jerry Stearns and Brian Price of Great Northern Audio Theatre have celebrated the celebration by writing and producing their own ridiculous sci-fi satires performed before a live audience just preceding the awards ceremonies. These silly shows have always been well received and under distributed. But right now you can download them ALL from the fine folks at ZBS. All highest quality audio at 320 kbps, with PDF covers and liner notes. For the first time ever—the compete package of Mark Time shows in one place for one low price. Space travel, time travel, kids, monsters and inflatable dreams—no subject was left unscathed—though we promise few Tribbles were harmed during the recording of these shows. 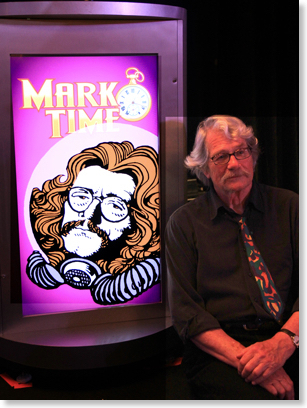 David Ossman of the legendary Firesign Theatre and in reality, Mark Time himself, was often on hand to celebrate the celebration. His talented friends and compatriots, Phil Proctor and Melinda Peterson, made wonderful appearances as well. Besides, if Santa Claus lived in outer space he probably would look and sound a little bit like Mark Time. Over the years Mark Time has played host to some wonderful guest stars: Michael Sheard (Admiral Ozzel of Stars Wars), the grand dame of fantasy—Jane Yolen, the Voice of the Tonight Show—Wally Wingert, and the amazing voice talent Chuck McCann (CooCoo for Coco Puffs). Turner recalls heading up into the Appalachians to search for Laze Fitzgerald, and finding everything but. Turner follows Laze Fitzgerald’s directions, and recalls a particularly memorable event they both attended when they were teenagers, before things fell apart. Turner Ashbey remembers back to the 2030s when Laze Fitzgerald went missing, how he figured out where she might be headed, and what he did about it--all those years ago. 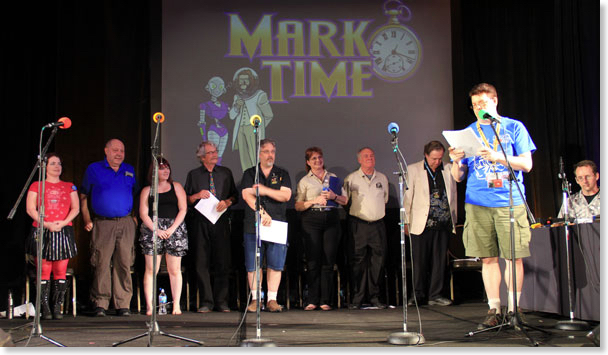 The Mark Time Radio Show at Convergence 2012 was a huge bit of fun. We had a terrific cast, lots of sound effects, and an enthusiastic audience. We marked the convention theme of “Wonder Women: women in science fiction” with a female heroine played by the fabulous Melinda Peterson. And we celebrated the 15th Anniversary of the Mark Time Awards with two members of the Firesign Theatre in the cast; David Ossman and Philip Proctor always add performance excellence to a production. Linda Kim Shelmerdine discovered her powers as a teenager, when she was a turmoil of solar and hormonal flares. Now she occasionally feels her age, and she’s tired of the way everyone seems to perceive of superheroes saving the world, always in it for themselves. Meet Dr. Creep, the Super Villain, and Senator Mulder Hack, chair of the joint joint sub-sub-committee, and the magnificent Hungarian Dwarf Parade, who are watching over SuperGirl’s personal affairs. Available now as a download from ZBS. Sound by Jerry Stearns and Kris Markman. Produced by Jerry Stearns and Brian Price. The year is 2096 and the 82 year-old Turner Ashbey has seen a lot in the turbulent 21st century: The rising oceans, the Eastern Migration, the Stay Put, the Tax Indentures and of course, the collapse and dissolution of the United States Federal Government into fifty-three "ephemeral nations" as Ashbey liked to call them. Writer, historian and former ambassador to the Great State of Colorado, Turner Ashbey looks back at his life including his on and off again relationship with resistance leader, Laze Fitzgerald, in this Audio Novel by Brian Price. 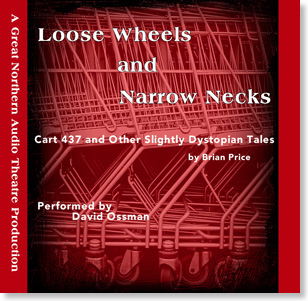 Brought to you and produced by Great Northern Audio Theatre. A new chapter is planned to be released every two to four weeks.